Hinglish alone won’t do. Any business targeting India must crack these languages. The problem of deciphering Indian English isn’t confined to visitors. In the digital world, machines have to deal with it as well. Amazon’s Alexa speaker, for example, has started shipping to India only now, two years after its release. One reason for holding it back is to give time to linguists and developers to get the Alexa virtual assistant up to speed with Hinglish – a blend of Hindi and English, spoken with a distinct Indian accent. 9 out of every 10 new internet users in India over the next five years are likely to be Indian language users. Now the Alexa speaker can handle requests like, “Please add jeera, atta, and haldi to my shopping list.” The English words for those are cumin, wheat flour, and turmeric, but few Indians use them in conversation. “Alexa is not a visiting American, she has a very Indian personality,” says Parag Gupta, head of product management for Amazon Devices India. Amazon is not the only one learning Hinglish. Google has a Hinglish-speaking virtual assistant, although it has yet to launch Google Home speakers in India. Apple wants Siri to get the cultural nuances of dialog in India, and has a Hinglish keyboard for the iPhone 8 and iPhone X.
It’s not easy. Hinglish can vary depending on whether you’re in Delhi or Hyderabad. Folks in Hyderabad pride themselves on their “Hyderabadi Hindi” which has influences of Urdu because of its heritage of Muslim rulers, as well as the local language Telugu. each spoken by more than a million native speakers. Thus, even though such a large domestic market with a population of 1.3 billion is enticing for internet businesses, it’s far more diverse than neighboring China. Mandarin Chinese is spoken by the vast majority in mainland China dominated by the Han ethnic group. Urban India’s widespread use of English is often cited as an advantage over China for global businesses, but it’s a different picture when it comes to targeting the hundreds of millions in the interior or even among the lower middle class in the big cities. Less than 100 million out of India’s 700 million literates can read or write English. And most of the new internet users belong to the latter group, drawn in by the availability of affordable smartphones and falling data costs. Five regional languages represent 75 percent of the digitally engaged audience who prefer to communicate in their native languages. So how can a business overcome multiple language barriers to target these hundreds of millions of non-English-speaking or even Hinglish-speaking consumers? One strategy is to zero in on the most used Indian languages. As many as 90 percent of the 700 million literates in India can read and write at least one of India’s 12 major local languages. 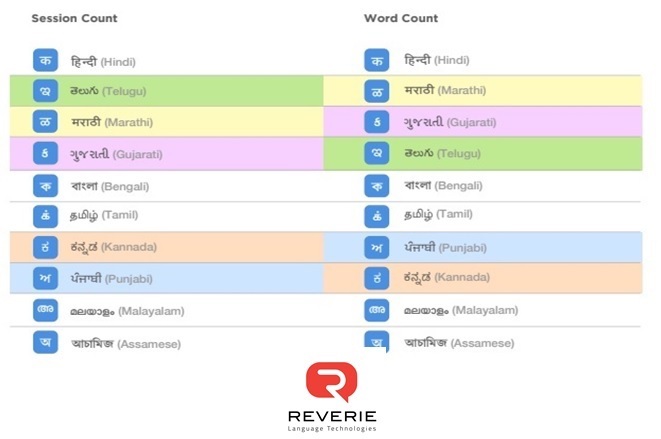 And among those, Hindi, Marathi, Gujarati, Telugu, and Bengali are the top five Indian languages that any business or app developer localizing digital products for the Indian market should not ignore, according to the first Digital Indian Language report (PDF) published by Reverie Language Technologies. Reverie has been trying to bridge the “Indian language divide” in the digital world since its inception in 2009. It built a cloud platform that businesses, OEMs, and chipset-makers can use so that the end-users of their products can consume digital content in their preferred regional language, real-time. Through a set of APIs, Reverie’s tech stack on the cloud offers services like local-language translation, transliteration, device input, and search. The company also has an Indian language keyboard, Swalekh Indic. It helps users type text messages, Facebook updates, tweets, emails, blogs, and so on in any of the 22 Indian languages. For its report, Reverie studied around 27,000 unique Android smartphone users who have been using Swalekh for six months – January to June 2017. 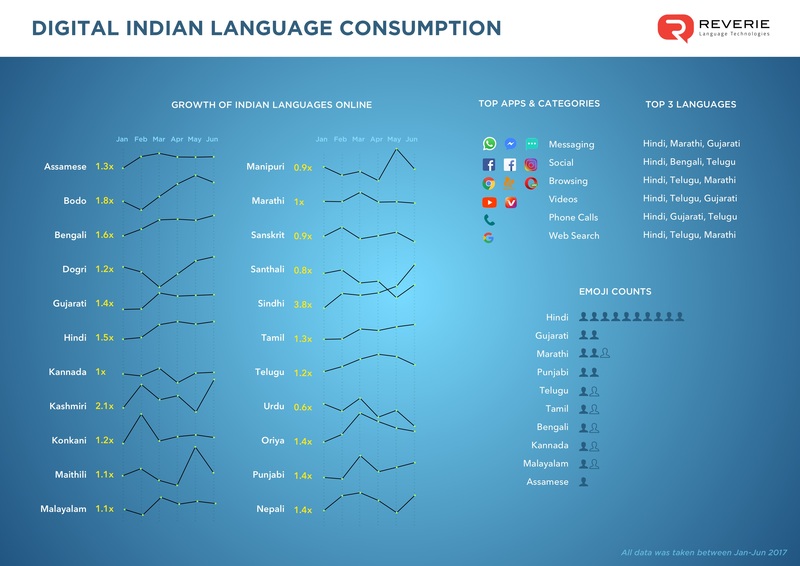 Not surprisingly, WhatsApp is the most popular app with Indian language users using the Swalekh keyboard. As much as 35.95 percent of sessions on all Indian languages was spent on WhatsApp. 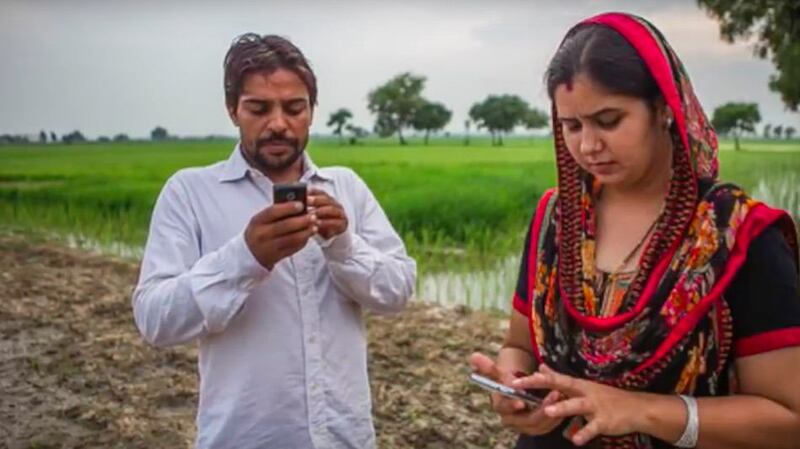 A report (PDF) published earlier this year by Google and KPMG estimated that Indian language internet users will drive the next phase of internet adoption in India. They’re expected to constitute more than 2.5 times the English internet user base by 2021. Indian language internet users grew to 234 million by the end of 2016, surpassing the number of English internet users. 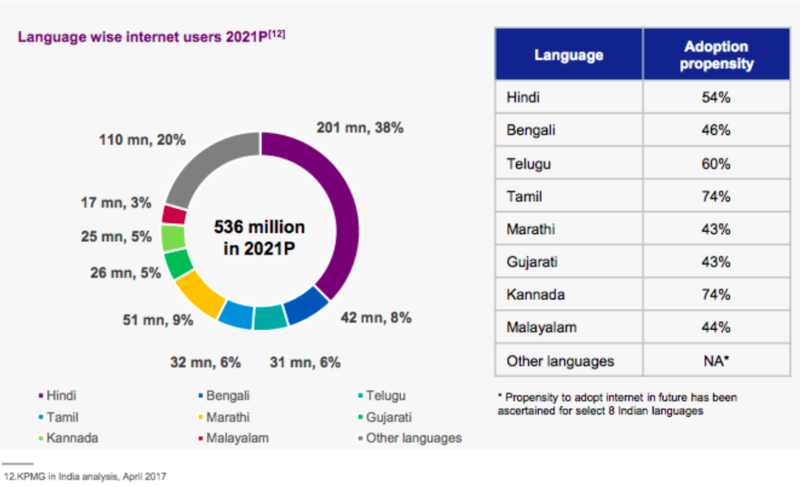 The number of Indian language internet users will continue to grow at an annual rate of 18 percent to reach 536 million by 2021, while English internet user base will grow at 3 percent annually to reach 199 million. 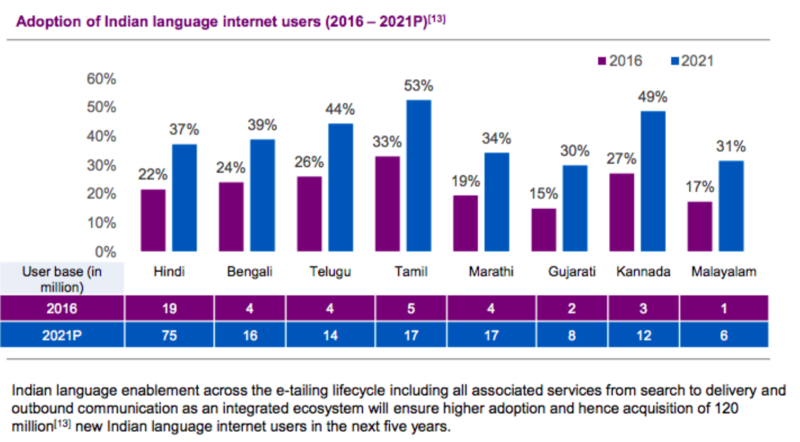 By 2021, Indian language users would account for about 75 percent of India’s total internet user base. While only 42 million Indian language internet users currently access ecommerce, this will grow 32 percent annually to hit 165 million users by 2021. Currently, 47 million Indian language internet users access digital payments products – to top-up credit for phone and pay utility bills mostly. This number is expected to grow 30 percent annually to hit 175 million by 2021. Digital news will add over 180 million Indian language users by 2021 to reach a total of 284 million readers. This will be 85 million higher than the number of English users. A rural user spends 15 percent more time consuming digital news compared to an urban user. Indian language digital entertainment with a user base of 167 million currently will reach 392 million by 2021. While chat apps and digital entertainment will continue to have high adoption levels amongst these users, ecommerce, online government services, and digital classifieds would clock the highest growth in adoption rates across Indian language users till 2021.